Mogdurz is an Orc miner who works in Gloombound Mine, right next to Narzulbur. She spends her whole day mining the ebony and iron ore veins in the caves. She wears a blacksmith's apron and a pair of shoes. 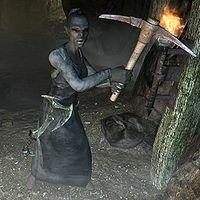 She carries a small amount of gold, a pickaxe, and a war axe which can be either steel or Orcish quality, depending on your level. She will be dismissive of you, saying "I'm here to mine, outlander. So unless you want to dig, get out." or "I have metal to dig." However, she may occasionally be more talkative, telling you, "Malacath has given me the task to mine. Good ore brings strength to our people." or " Every Orc learns the heavy labor of mining. All spend years in the caves." or "The mines are hard, but Malacath rewards those who rise to the challenge." This page was last modified on 21 March 2014, at 18:33.